at luce ends: It's a Girl! Yesterday we had our 16 week anatomy ultrasound. The tech was able to tell (for real this time!) that our baby is a girl! We had been told at 10 weeks that it looked like a boy, then at 13 that it looked like a girl, but that we would know at our 16 week appointment. 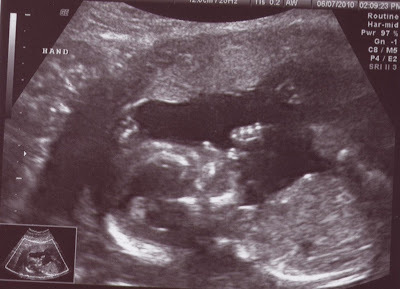 The ultrasound again took about an hour. They measured her bones, looked at her heart, showed us the umbilical chord and blood flow, and counted fingers. Below is a picture of her hand and profile. 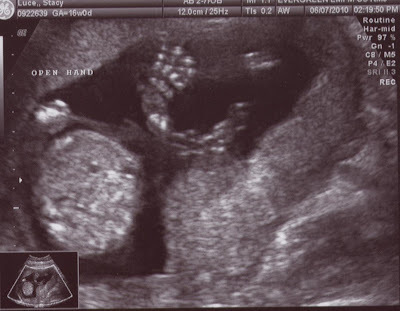 This is a picture of her little hand open, which the tech got excited about. She said babies with open hands, as opposed to clenched fists, are very healthy and don't generally have birth defects. 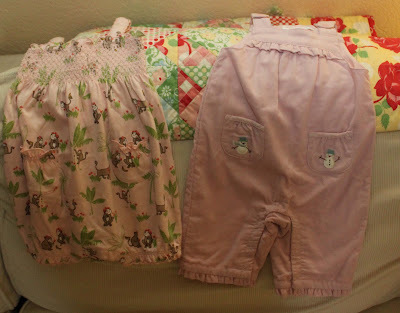 After our appointment we went and picked out a couple cute girly outfits! We ended the evening with dinner at the Spaghetti Factory (our favorite!) and by starting our registry at Babies R Us. AWESOME!!! Fun times! We went out and registered right after we found out Josiah was a boy. That was such a great day! I'm sure you have memories to last a lifetime!